Grab the Corsair K70 MK.2 at Amazon today for just $100. That's a great price if you don't mind the quiet tactile simplicity of Cherry MX Brown switches. If you sit in front of a computer all day, one of the best upgrades you can get for yourself is a mechanical keyboard. And Amazon’s currently offering a great deal on a stupendous mechanical keyboard that will up your typing game without driving everyone around you crazy with an obnoxious clickety-clack sound. The Corsair K70 RGB MK.2 with Cherry MX Brown switches is just $100 right now. This keyboard has been sitting at $100 all week down from $160, though this keyboard also dips into $120 territory with relative frequency. The main feature of any mechanical keyboard is its switches, and the Cherry MX Browns inside Corsair’s K70 Mk. 2 are a very tactile switch. That means you’ll feel be able to feel when the switch is activated, thereby reducing the unconscious effort you put into typing. What’s great about Brown switches, however, is that they don’t have that loud clickety-clack sound that Cherry MX Blue switches have. That makes Browns a great option for working or playing in close proximity to others. One thing you can’t hide from your co-workers or your family, however, is the gamer aesthetic of this keyboard’s RGB lighting. Luckily, you can turn that off if vibrant LEDs aren’t your thing. For gamers. this keyboard also comes with 8MB of profile storage, USB passthrough for connecting peripherals like a headset or mouse, anti-ghosting and full-key rollover for proper key registers when you’re moving fast, and Corsair’s iCue software for syncing your lighting set-up across Corsair devices. 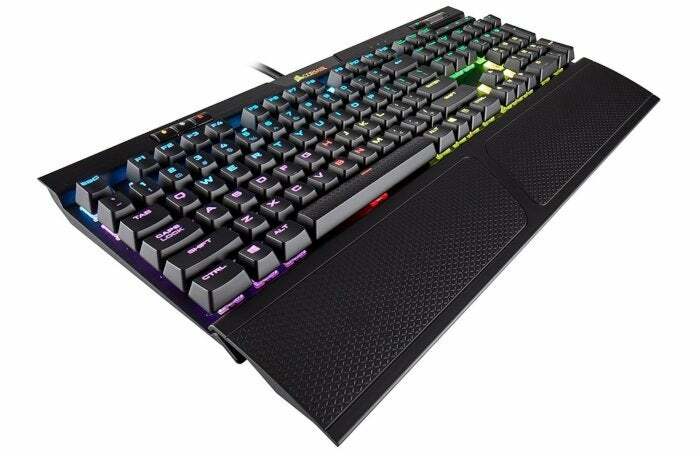 This story, "Corsair's superb K70 MK.2 mechanical keyboard with Cherry MX Brown switches is $60 off" was originally published by PCWorld.